The Redfish or Red Drum is found along the United States East coast and Gulf of Mexico. The Red Drum is an excellent saltwater fish for anglers. Red Drum are a dark red color on the back, that gives way to a white belly. Their streamlined bodies are best distinguished by the eyespots located at their tail. Three year-old red drum typically weigh six to eight pounds, while full grown adults can weigh over 90 pounds. The largest Red Drum on record weighed just over 94 pounds and was caught in 1984 on Hatteras Island. Red Drums tend to prefer shallow waters near the edges of bays with plenty of vegetation. Although they can be found over all bottom types, they prefer to locations with plenty of submerged vegetation and soft mud. They tend to gravitate toward breaks in the shoreline and prefer the soft mud of jetties and pier pilings. You may find them in water that is so shallow their backs are exposed out of the water. They can actually live in freshwater and have often been found several miles upriver. Immature Reds prefer the grassy marsh regions of bays and estuaries, while the young and mature prefer the muddy rocky outcroppings of jetties and man made structures, like docks, rigs and bridges. Mature reds spawn from mid-August to mid-October along the shorelines. The female will lay between 200,000 and 3,000,000 eggs per batch with an incubation period of only 24 hours. They grow over 0.5 mm per day during their first year and reach reproductive maturity at about 4 years. If they can survive the wild a red drum can live to be 60 years old. Young reds feed on small crustaceans and marine worms. As they mature, they feed on larger crustaceans or small fish. 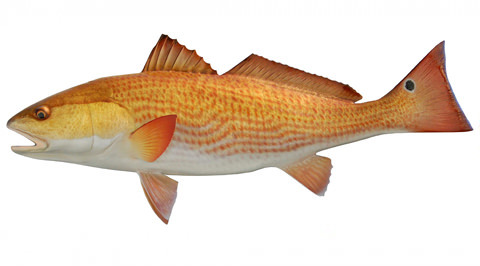 The red drum is generally a bottom feeder and will generally feed with their head down. In the shallows, their tails are exposed resulting in a phenomenon called “tailing.” The Red Drum predators include humans, birds, larger fish and turtles.